BURLINGTON, VT – Standing by the Democracy sculpture outside the Main Street Federal Building, members of Rights & Democracy delivered an open letter, signed by over five thousands Vermonters, to our state’s superdelegate supporters of Hillary Clinton. Since the letter was first made public, one of its recipients, Senator Patrick Leahy, has “clarified” his position, saying he will vote for the candidate who has won the majority of pledged delegates at the end of the primary season. At the press conference, Rights & Democracy leaders released a statement calling on Vermont’s and all other state’s Democratic party superdelegates to follow Senator Leahy’s lead by committing to cast their superdelegate vote in accordance with the pledged delegate majority, and to work for the elimination of the undemocratic superdelegate system altogether. “We have been overwhelmed by the amount of support this open letter received. 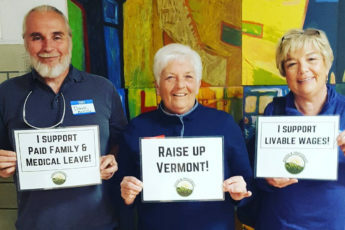 It is clear people are ready for a much more democratic system,” said Brittany Nevins, founding board member of Rights & Democracy, the grassroots organization who posted the open letter on social media which was circulated widely and within one week garnered over 5,000 Vermont signatories. Background: The “Open Letter to Vermont Superdelegates” called on U.S. Senator Patrick Leahy, Governor Peter Shumlin, former Governor and former DNC Chair Howard Dean, and Democratic National Committeewoman Billi Gosh to cast their vote in accordance with the 86.1% of Vermonters who supported Senator Bernie Sanders in the Democratic primaries. It received national media attention when Senator Patrick Leahy retracted his original pledge to back Clinton and instead committed to supporting the candidate who has the most delegate votes once all the states have held their primaries or caucuses.